A loan of $2,025 helped a member to buy 2 piglets to raise and sell. The Bawi Lestari 1 group paid all of the loan on time. With 7 members, they can keep their pigs well and they grow rapidly. The pigs stay disease free because they always give them vitamins and nutritious feed. 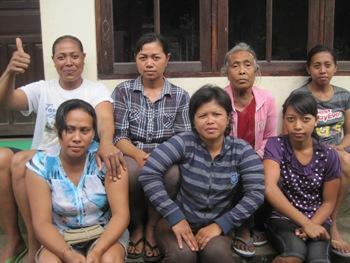 Ni Nengah, as the head of the group, succeeds in organizing the group and also selling her pigs. She earns 250,000 IDR per pig. She has 4 pigs. She’s really satisfied with the result. She says thank you to the lenders, Kiva and MUK for supporting her business. She keeps the profit to save for future needs. The Bawi Lestari 1 group receives their fifth loan of the same loan amount and with the same members. The loan is used to purchase piglets, feed and to renovate the barn. The group still needs to borrow until they all have enough savings to use for capital. With support from her husband, Ni Nengah continues with her loan and uses it to buy 2 piglets and also to support her husband's business as a salesman of wood for building materials. She wishes this time she will have more success and she can save more.